Popularly known as Phool Gobi, cauliflower has marginally a nutty flavor and available in plenty in your local markets from December through March. The glycemic index of cauliflower is 10 which is exceptionally low. The glycemic load of ½ cup of chopped raw cauliflower is 1 which is again very low. Is Cauliflower safe for Diabetics? The glycemic load of ½ cup of chopped raw cauliflower is 1 due to only 3 g of carbohydrates in it. Carbohydrates plays a major role in managing your blood sugar levels. The recommended amount of carbohydrate per meal is 45 to 60g. Thus vegetables such as cauliflower which is low in glycemic index can be easily included in a Diabetic diet. The fiber content in chopped raw cauliflower (2.7g in ½ cup) helps in slow release of nutrients in the bloodstream and regulates blood sugar levels. Is Cauliflower suitable for Weight Loss? 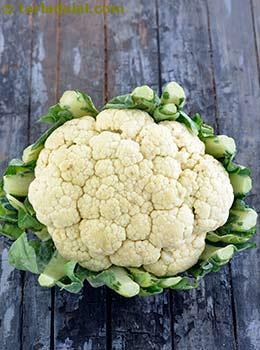 ½ cup of chopped raw cauliflower has only 23 calories which fit in your calorie restricted diet plan. Plus point is ½ cup of chopped raw cauliflower also contains 2.7 grams of fiber that slow down the process of digestion and makes you feel satiated for a longer period of time. Thus your calorie consumption is reduced. Hence include more of fiber rich food in your diet for better results. It has negligible amount of fats.